First Cut – an educational series…. Is there cause for alarm when bacon has morphed from a simple breakfast companion and common staple of testosterone laden men into a liquid sidekick of refreshment and fizziness? I say Nay! Bring on the bacon! 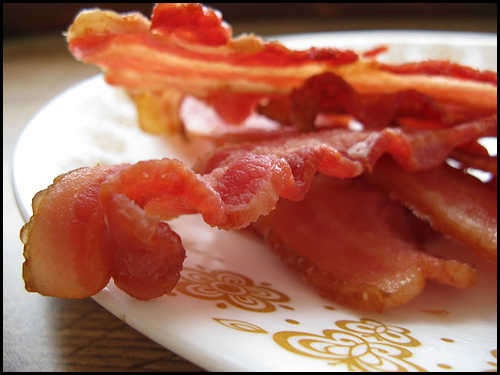 If you are of the carniverous nature when it comes to mealtime and have any sort of affinity for bacon, you’ve probably noticed that the marketplace of bacon flavored and bacon themed products has sky rocketed. An entire culture has emerged supporting the sizzly little strips of salty goodness. People’s imaginations have run wild and delivered products such as bacon salt, bacon flavored mints, bacon ties, bacon soap and more. I’ve dabbled in this arena a few times, as I too, often fall victim to the charms of a meat that has transcended the mear AM appearance or basic BLT. I’ve tried bacon flavored sunflower kernels and attemped to freshen after a meal with a bacon mint (not to be recommended for 1st date situations). A frequent candy bar found in my cupboard is the Mo’s Bacon Bar from Vosges Haut Chocolat. And now, you can add beverage to my list of samplings. My wife, knowing me all too well, graced me this evening with a gift pack of treats for our wedding anniversary. The focal point: Lester’s Fixin’s Bacon Soda. I’m sure many of you cringed at the completion of that sentence. It’s to be expected, with the thought of a salty meat on your table in liquid form. Let me tell you though, Lester’s delivered. The nose of the soda is spot on, with notes of saltiness and smokiness. One sip sits you down at the breakfast table with the salty, minerally haminess you enjoy with your eggs, but without the greasy residue. The finish is surprisngly crisp and refreshing with a little sweetness, like the maple of a good cured bacon. The soda may seem odd and a bit inappropriate, but I thoroughly enjoyed it. What’s the oddest thing you’ve had to eat or drink lately? Let us know below, along with a thumbs up or down as to whether the hungry crew of EBH should try it. *For more bacon related products and gift ideas, check out the links below. Looking for the soda, find it at Rocket Fizz locations. I snagged mine at the Ventura, CA store. Gallery | This entry was posted in Food Adventures, Yummy Products and tagged Bacon, Breakfast, Rocket Fizz, Soda. Bookmark the permalink. I must say that the mere thought of a bacon flavored soda would normally trip my gag reflex. However, after your tantalizing review I would give it a go! He’s to you Hungry man!!! Got a hankering for some Lesters Fixin Bacon soda? Swing on by Rocket Fizz Ventura at Oak & Santa Clara (downtown).Check out their Lesters Corn and Chicken Wings sodas as well!!!! We have tasted the Bacon soda, its great. We have sold many cases of it in our candy store.Its a hit for bacon lovers and it tastes great too. Enter your email address to follow Everybody's Hungry and receive email notifications of new articles.